It’s that time again. The weekend is here, and that means it is time to test out another dessert recipe from my ever-growing collection. Hubby and I both have a sweet tooth, which means making something yummy to last us the next few days. My go-to lately has seemed to be brownies and bars because they are quick, simple, and there are so many varieties. From rich and chocolatey to fruity and refreshing, there are never-ending possibilities with bars to make. 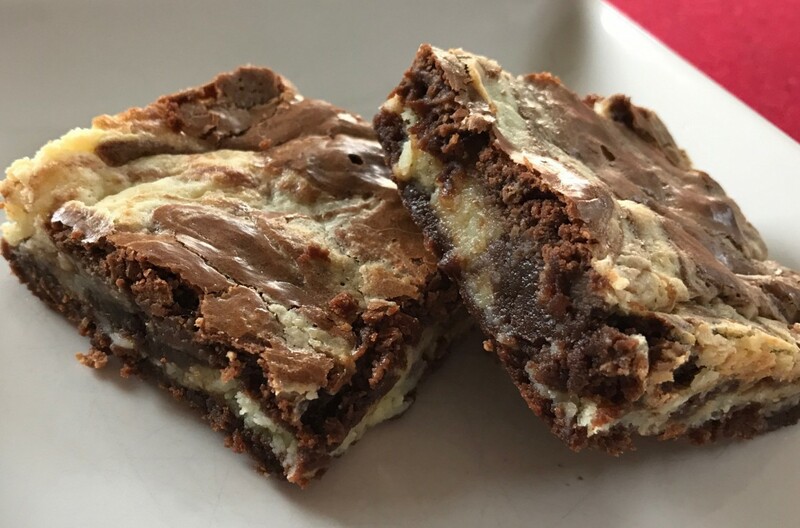 This week, I wasn’t quite sure what to make until stumbled upon Chocolate Cheesecake Brownies. What more can I say? With these cheesecake brownies, you have a little chocolate and some cheesecake creaminess layered within for a perfect combination dessert. The end result is a rich, soft, melt-in-your-mouth brownie that will leave you wanting more. I will note that I definitely recommend mixing up the cheesecake layer with an Electric Hand Mixer. It really does make all the difference in making the cheesecake layer smooth, getting out all the little lumps. Chocolate Cheesecake Brownies are pretty sweet, so a little bit does go a long way. The purpose of making them was to take to a cookout that hubby and I were invited to. We ‘taste tested’ the bars once they cooled a little to make sure they were suitable. Like what you see? Give it a share. Preheat oven to 350 F. Spray an 8×8 pay generously. In a medium bowl, whisk together the baking powder, cocoa powder, salt, and flour. Set aside. In another medium bowl, whisk together the sugar and eggs. Add to the melted butter and semisweet chocolate mixture. Stir until well combined. Pour wet mixture into bowl of dry ingredients. Mix well until combined. Melt the white chocolate chips in a microwave-safe bowl in 20-second increments. Stir well after each 20 seconds until smooth and creamy. In a medium bowl with a hand mixer, mix together the cream cheese, sugar and egg until well combined and creamy. Stir in the melted white chocolate. Pour half of the brownie mixture into prepared pan. Place spoonfuls of cheesecake mixture on brownie mixture and spread out in an even layer. Spread remaining brownie mixture on top of cheesecake mixture. Take a knife all the way through the batter and swirl or drag throughout the pan so that you see both cheesecake and chocolate on the top. This can be done in a ‘design’ of your choice. Myself but I am lucky to know you and have tasted your baking , I would love for you to make me some sometime! I would pay you of course! Omg I’m so trying these. Pretty much anything with cheesecake is a YES from me. Thank you!! I agree! If something has the word ‘cheesecake’ in the name, I know I have to try it! Thanks for stopping by! OMG!! I’m speechless!! Love it! They definitely are worth making, and pretty easy too! omgosh, i’m already wanting these sweet choc cheesecake brownies. i will make soon! They are definitely worth trying! Let me know what you think whenever you do try them! These treats look so yummy! Thank you for sharing the recipe, I’m sure my boyfriend will want me to bake these! If you like fudgy, soft brownies, they’re perfect! If you make them, you’ll have to let me know what you and your boyfriend think! They definitely didn’t last long here! haha. Thanks for stopping by! These look delicious! 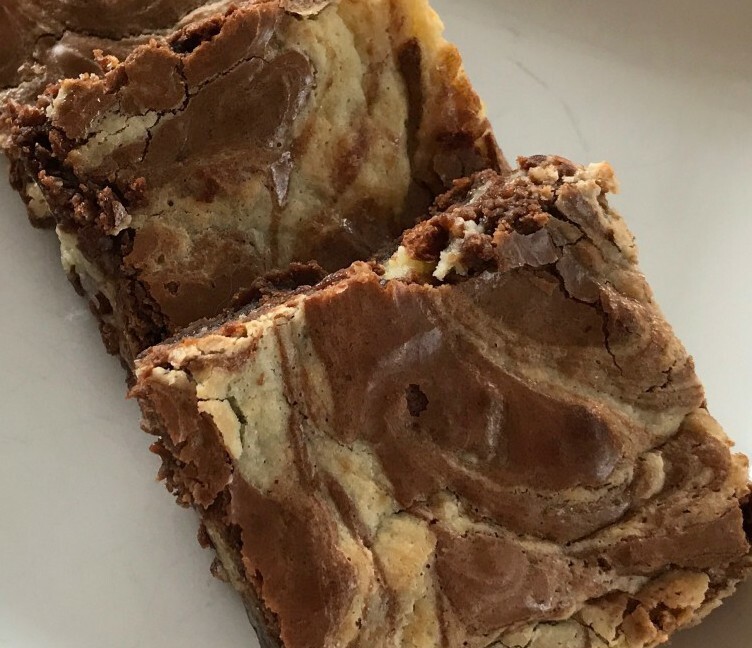 I confess that most of the time I make brownies, they come from a box, but I have been looking for a good cheesecake brownie one and the fact that this one starts from scratch makes it look even better! This is going on Contentment Questing’s Recipe board on Pinterest. I may even try it this week! I have one go-to box brownie that I use when I have to whip something up quickly. lol. I do try to make them from scratch, though, whenever possible. If you do try these, let me know what you think!